The family-run Praesidium winery was founded by Enzo Pasquale and his wife Lucia in 1988. Enzo, born in Prezza and deeply passionate about his land, has been producing wine since when he was a boy, working the Montepulciano d’Abruzzo vines that belonged to his grandparents.It was the awareness of the high quality Montepulciano d’Abruzzo grapes that were cultivated with great care and dedication that led Enzo and Lucia to be confident that they could found the Praesidium winery. Today Enzo and Lucia are joined by their daughter Antonia and son Ottaviano. Because Prezza served as a fortress for the defense of the territory of Corfinio during Roman times, when “Corfinium” was the capitol of the italic populations (90-89 B.C. ), in the XV century Prezza was known as “Praesidium” , which now serves as the name of our estate. 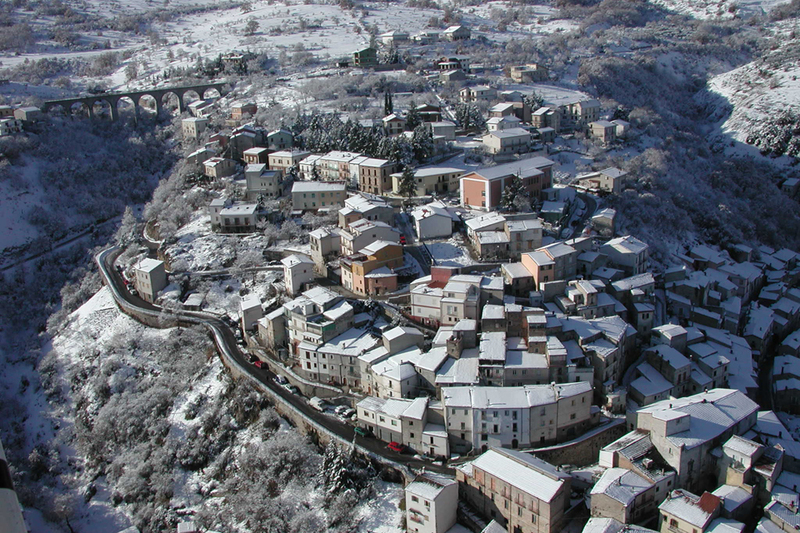 The town Prezza is perched up on a rocky side of the homonymous mountain. 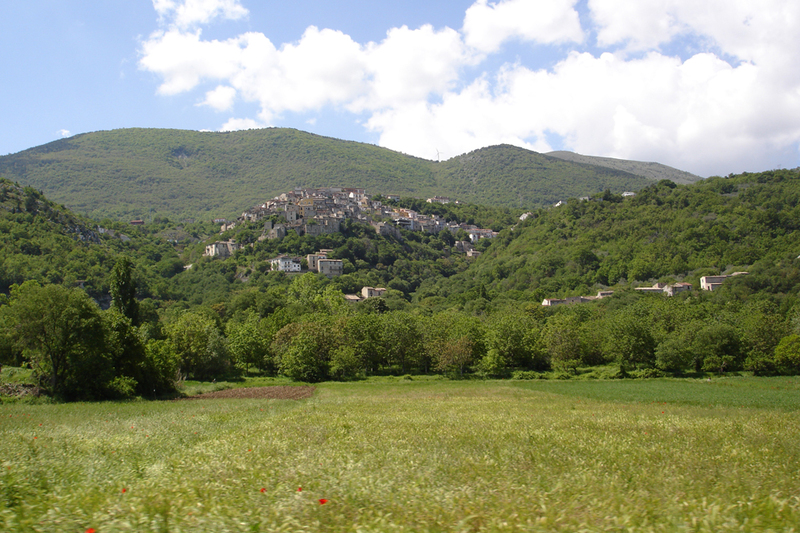 From Prezza one may appreciate the beautiful landscape of the Peligna Valley below and the surrounding Apennine range. Using the original latin name seeks to underline the integral link between the Montepulciano d’Abruzzo wine produced and the territory and history from which it originates. While the vineyards are located on the border between Raiano and Prezza, in an area particularly appropriate for growing the Montepulciano d’Abruzzo vines and regarded as the birthplace of this autoctonous vine, the cellars are located in the highest and most rocky area of Prezza. Two of the cellars are in caves carved out of the rock that is under the foundations of the houses above. 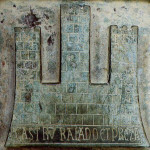 The image of the three towers that is found on the label of the wine bottle was inspired from the image of the three towers accompanied with the inscription “Castru Raiano et Preza” that is etched onto the bronze portal located in the Abbey of San Clemente a Casauria, built between 1182 and 1189. 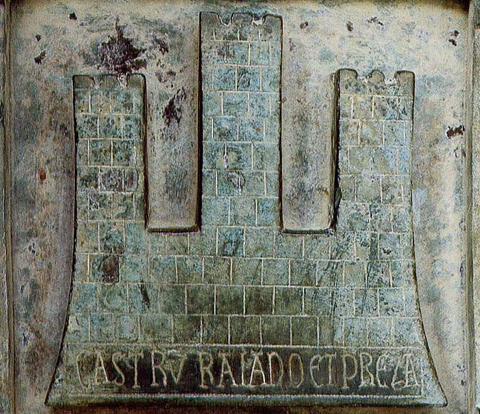 Today the three towers remain the insignia of the town of Prezza. […] The village was huddled on a rocky slope. To reach the fields one picked one’s way among rubble, rocks, brushwood, parched and prickly bushes, one went through vineyards, and still farther down, in the direction of Pratola basin, one came to fields of beans and corn, and poplars, willows, and fruit trees became more and more numerous; still farther down, past fields of vegetables and wetlands, one came to vast fields of wheat. Every morning the poor villagers left the dark dens carved out of the mountainside and made their way down to the plain like a procession of ants in search of food. Winter had left white sheets of snow on the surrounding peaks, Monte Prezza, Monte San Cosimo, the Morrone mountains; but the long, arid lower slopes, some rounded, some steep, were already covered with gray and brown blankets, and the plain was an irregular carpet of every shade of green. For several days past the tender young corn plants had been putting out three or four tender leaves, and the time had come to feed them, hoeing the earth with a mattock. […] From “Il Seme Sotto la Neve” by Ignazio Silone, translation by Eric Mosbacher revised by Darina Silone.